V Capri. Cattletruck. Bang The Drum. In our trips back to the ARIA charts of decades past, we've seen plenty of homegrown bands that never quite made it. But for every pub rock also-ran or radio-friendly pop/rock wannabes, there were others that broke through with a big hit single and, in some cases, managed to maintain their success. This week in 1987, a Sydney band fronted by a New Zealand expat debuted on the top 50 with the song that'd take them into the top 10 and turn them from minor hit-makers to major players on the local music scene. 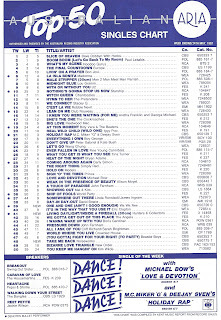 Another Kiwi performer was the biggest player on the chart this week in 1987. Dave Dobbyn stepped into the top spot with "Slice Of Heaven" - and would stay there for four weeks. The title track of the J.Geils Band singer's first solo album just dented the ARIA top 50 in 1984, but despite having the bounciest music video ever made, this lead single from Come As You Are couldn't do the same. Also disappointing: "Come As You Are" is not on iTunes. 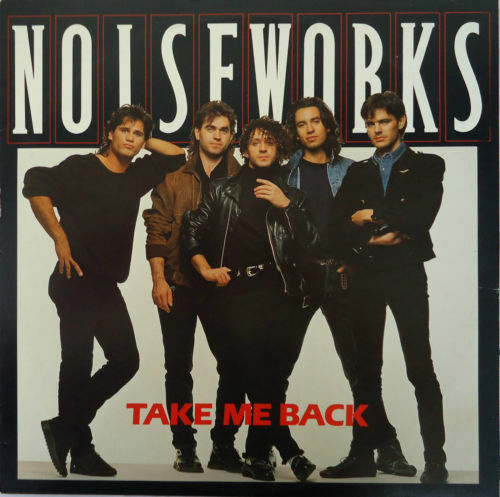 Musical burst of energy "No Lies" had been a great introduction to Noiseworks in late 1986, but the vast majority of Australia's record-buying public didn't share my enthusiasm for the power pop/rock track and it faltered just outside the top 30. Looked like it was time for a different strategy - and a different style of song. Brooding mid-tempo tune "Take Me Back" did the trick, sending the band into the top 10 for the first of only two times, while its smouldering music video established singer Jon Stevens as the new heartthrob of Aussie rock. I wouldn't be surprised if the one-two hit of "No Lies" and "Take Me Back" had gone exactly to plan - soften them up with a taster before delivering the knockout punch. Either way, Noiseworks had certainly arrived. Next up, a local band that might not have achieved a major hit yet - and wouldn't really ever do so. But, Hunters & Collectors had made up for their lack of a top 10 single with the success of their 1986 album, Human Frailty, which peaked at number 10 and ended up as the 29th biggest LP of the year. Despite the appearances of the YouTube clip below, "Inside A Fireball" was not taken from Human Frailty (although it would be included on a 1991 CD re-release). Instead it was the lead track from the Living Daylight EP, which was released to tide fans over until the band's fifth album, What's A Few Men?, came out later in the year. Neither it nor the EP's title track were the Hunters' best efforts, but they'd be back on form when they returned to the top 50 in November. Certainly more of a singles act than an albums one, Wa Wa Nee had notched up three top 10 singles in just over half a year. And the fact that their debut self-titled LP hadn't done so well perhaps explains why they also made the top 20 with its fourth single. For me, "One And One (Ain't I Good Enough)" is the synthpop band's second best song (after "Stimulation", obv) and it seems their international success with "Sugar Free" had convinced their record company to splash out on a pricey location video, complete with helicopter shots. After a start to their career like this, surely the sky was the limit for Wa Wa Nee? Not so much, with an 18-month wait for new music killing the momentum they had. Next week: an upbeat return for the big ballad queen and an all-star remake of a Beatles song in the wake of a tragedy off the coast of Belgium. 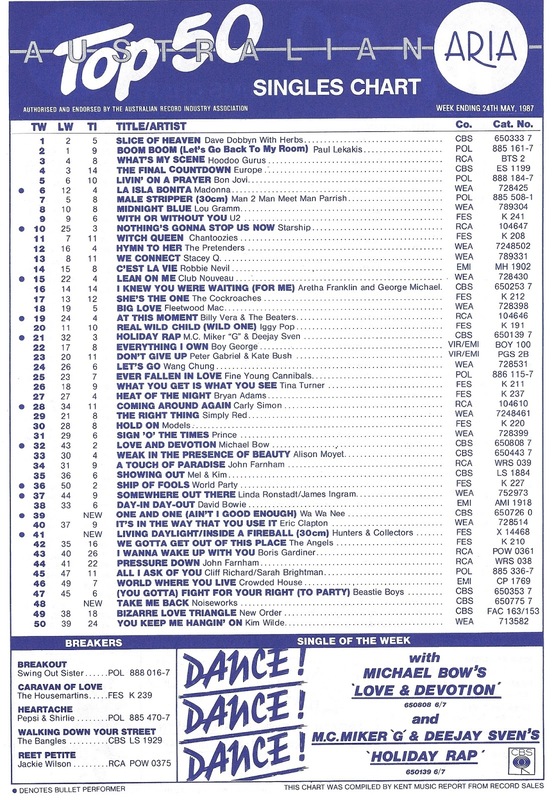 Plus, the first chart appearance by a future superstar DJ. The Peter Wolf video, which I hadn't seen before, is certainly interesting. I dread to think how many rehearsals/takes it took to get right, and how exhausted you'd be at the end of it; even with the concealed scene/take transitions. Noiseworks seem like they were bigger than they were. 'Touch' was probably my favourite. Someone wrote that Wa Wa Nee's debut album was certified gold or platinum (I think the latter) in Australia, despite its relatively low peak, which I find difficult to believe (esp. with the pre-1989 100k shipment that would have been required), and of course no source was provided. I must have heard ‘One and One’ before (it's on '87 Right On Track if nothing else), but can never remember how it goes. 'So Good' would be my fave of theirs. Did the drummer, Chris Sweeney, die? I recall reading a small article on the Bitz page (or similar) in Smash Hits in early-mid 1989 saying that someone who had worked with both Wa Wa Nee and the Eurogliders had died from lymphatic cancer, and on his discogs page he's listed as working on their 'Groove' album, with nothing much after then. The article said that the Eurogliders song 'Precious' was dedicated to him (or whoever the article was about). It would explain why they were a trio for the second album.